The distribution of normal matter precisely determines gravitational acceleration in all common types of galaxies, a team led by Case Western Reserve University researchers reports. The team has shown this radial acceleration relation exists in nearby high-mass elliptical and low-mass spheroidal galaxies, building on last year's discovery of this relation in spiral and irregular galaxies. This provides further support that the relation is tantamount to a new natural law, the researchers say. "This demonstrates that we truly have a universal law for galactic systems," said Federico Lelli, formerly an astronomy postdoctoral fellow at Case Western Reserve University and currently a fellow at the European Southern Observatory. "This is similar to the Kepler law for planetary systems, which does not care about the specific properties of the planet. Whether the planet is rocky like Earth or gaseous like Jupiter, the law applies," said Lelli, who led this investigation. In this case, the observed acceleration tightly correlates with the gravitational acceleration from the visible mass, no matter the type of galaxy. In other words, if astronomers measure the distribution of normal matter, they know the rotation curve, and vice versa. "But it is still unclear what this relation means and what is its fundamental origin," Lelli said. The study is published online in Astrophysical Journal today. Co-authors are Stacy McGaugh, chair of the Department of Astronomy at Case Western Reserve, James Schombert, astronomy professor at the University of Oregon, and Marcel Pawlowski, former astronomy postdoctoral researcher at Case Western Reserve and current Hubble fellow at the University of California, Irvine. The researchers found that in 153 spiral and irregular galaxies, 25 ellipticals and lenticulars, and 62 dwarf spheroidals, the observed acceleration tightly correlates with the gravitational acceleration expected from visible mass. Observed deviations from this correlation are not related to any specific galaxy property but completely random and consistent with measurement errors, the team found. The tightness of this relation is difficult to understand in terms of dark matter as it's currently understood, the researchers said. It also challenges the current understanding of galaxy formation and evolution, in which many random processes such as galaxy mergers and interactions, inflows and outflows of gas, star formation and supernovas, occur at the same time. "Regularity must somehow emerge from this chaos," Lelli said. To make their discovery, researchers combined different tracers of the centripetal acceleration found in different types of galaxies, from which they made 1-to-1 comparisons. The kinematical tracers were cold gas in spiral and irregular galaxies, stars or hot gas in ellipticals and lenticulars, and individual giant stars in dwarf spheroidals. The investigation included so-called ultra-faint dwarf spheroidal galaxies, but due to their lack of light—which makes them hard to study—the researchers can't confidently offer a clear interpretation of the radial acceleration relation in these. Nevertheless, the growing proof of the relation, or natural law, requires new thinking about dark matter and gravity, the researchers said. "Within the standard dark-matter paradigm, this law implies that the visible matter and the dark matter must be tightly coupled in galaxies at a local level and independently on global properties. They must know about each other," Lelli said. "Within alternative models like modified gravity, this law represents a key empirical constraint and may guide theoretical physicists to build some appropriate mathematical extension of Einstein's General Relativity." The team's research so far has focused on galaxies in the nearby universe. Lelli and his colleagues plan to test the relation in more distant galaxies, just a few billion years after the big bang. They are hoping to learn whether the same relation holds during the lifetime of the Universe. So, it looks as if, with all of the different kinds of matter found in, around and between stars, that they have enough mass that gravity and the forces from known matter are all it takes to produce the speed of rotation we see in these galaxies. This will throw Zwickey's idea of Dark Matter pretty much out the window since it was those very orbital speed parameters of stars in galaxies that the idea of dark matter came about i the first place. Ho, ho, ho, Steely, just you wait until the DM Enthusiasts get here & see what you wrote about their godfather Fritz Zwicky. That journalist who goes by RNP is going to inundate & intersperse your Comment with so many links about INFERRED GRAVITY that we'll all go googooeyed trying to get to them all, or maybe it'll be the Jonesy bloke beating him to it with his usual name calling routine. This should be the death knell of dark matter, but I don't suppose it will be. When you find that the visible matter is sufficient to account for the observed acceleration, there should be no reason to continue to hold to the notion invisible matter. It'll take a few minutes. They all are required to go first to the Earth Sciences, where they have all their nano-aggressions arising from their white privilege absolved by Mother Gaia by screaming "DENIALIST!" at everyone who who won't convert 100% to their dogma. Only after their daily religious obeisance to Pope Karl of Marx has been performed are they permitted to go forth and defend their minor deities from you heathens and blasphemers. Someone had to be first with an hypothesis that others might readily devise methods of falsification for. It would appear Zwicky made the mistake of conferring our local gravity curve on other galactic entities. WhyGuy, seriously for a minute here.......have you really ever looked in a mirror & wondered what the rest of your missing 80-95% looks like? Now, on the other hand.......have you ever looked at a pic of Zwicky? Can you imagine that on more than just a few occassions he would look in a mirror & wished that 80-95% of himself were missing? Why am I reminded of the term Frame Dragging? Sure it was first brought out in the terms of the space near a Black hole...but if 99% of the galaxies stars are all moving in the same direction, would that not have the same effect in the galactic structure...as when all the kids in a pool move in the same direction and then be carried by the current they created? The left-hand plots show the observed rotation curves (black points) and the expected contributions from various baryonic components. The blue line shows the TOTAL of the expected rotation from baryons alone. In the right-hand plots, the observed acceleration is plotted against that expected from the baryonic components alone. Both sets of plots show that rotation velocity and acceleration exceed that expected from the baryons components - i.e. the DM effect. However, the paper argues that the difference is more CONSISTENT than expected, suggesting a MOND-like interpretation. We already know 2 facts: 1) There is a strong force inside an atom, holding protons and neutrons together. 2) A problem of fusion reactors is bringing elements together, so that they can fuse, because there is a repellent force between these elements. I think, gravity is a side effect of 1) and the acceleration relation is a side effect of 2). Gravity: Not everything of the force described in 1) is fully encapsuled inside an atom. A little bit of this force also passes from interior to exterior. This exterior part is gravity. Acceleration relation (AR): Image a city. If you are in the city you can hear a lot of different sounds. But if you are on a mountain not far away from this city you hear one single overall tone, you can't discriminate between different sounds any more. Some atoms don't want to join together. Each of these different atoms has a typical "sound". And all the atoms of an planet together form an overall "tone". And this tone is the force, that causes AR. Am I missing something? Probably because I am not an Astrophysicist-Skippy, just the engineer. I thought this article is about radial movement of the galaxies (expanding space) not the rotational motions. Is that wrong? All the comments are trying to argue about the rotation and gravity when the article is about the radial expansions of the space. Both sets of plots show that rotation velocity and acceleration exceed that expected from the baryons components - i.e. the DM effect. Rguy, you as one who has admitted to being a journalist, need to learn to do better science than this.....you can spend all daylong rummaging through WikiPedia sites looking for something to buttress your arguments for your faith in DM Cosmic Fairy Dust, but until you are able to comprehend the concepts of gravity Einstein laid forth in General Relativity you will be forever as lost as Ira is. The paper is not about radial expansions, it talks about "radial acceleration", which is just another term for the centripetal force provided by gravity. This is, of course, what sets the required "rotation velocity" for the stellar orbits around the galaxy to be stable. Thanks for that. I thought maybe I was reading him wrong, now I got it. Before journalists like you come to a chatroom discussing anything about cosmology, you should first attempt to educate yourself about the basics of Rotation Curves of Spiral Galaxies versus the Gravitational Dynamics of Elliptical Galaxies which make up 2/3 the mass of the Universe. Until novice journalists like you understand why Elliptical Galaxies do not require your convoluted explanations for the unfounded concepts of INFERRED GRAVITY to keep the Universe from imploding onto itself, you will continue meandering around in the insensible distortions of zany Zwicky & his followers who have never been able to come up with evidence that 80-95% of the Universe is MISSING. You manage to again show amazing ignorance of a subject for which you have such strong opinions. 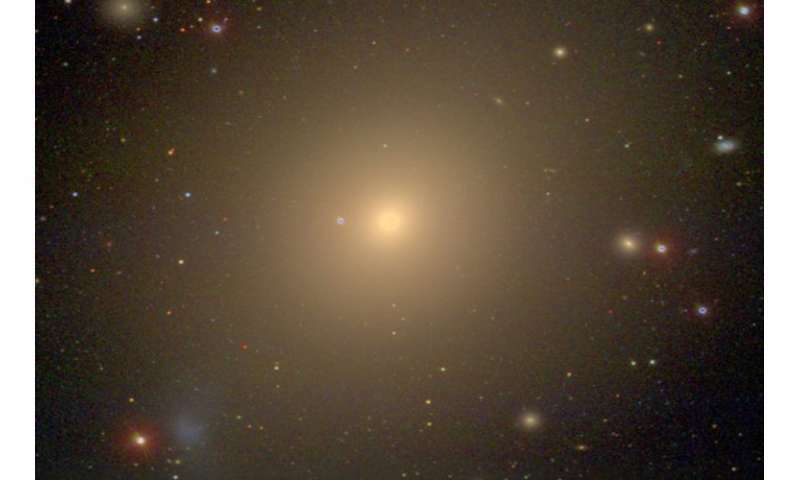 1) Simply do a google search on "dark matter in elliptical galaxies" and you will find literally HUNDREDS of papers in peer reviewed journals showing that it is just as important in elliptical as in spirals. 2) Galaxies or universes would not "implode" without the DM effect, a better word would be evaporate. 3) "INFERRED GRAVITY" is the whole subject of the paper. IF you had read the paper you would have seen that they chose ellipticals with high rotation velocity and then included the effect of the random velocity components (the pressure component) of their stars in the calculation of g_bar. Mr Rguy journalist, do better than just read the latest pop-sci explanations as sources for the science journalism you persist in regurgitating. "Within the standard dark-matter paradigm, this law implies that the visible matter and the dark matter must be tightly coupled in galaxies at a local level and independently on global properties. They must know about each other,"
As I have stated before with the evidence of dark matter halos surrounding galaxies, the presence of matter produces the surrounding effect of refracted light, which has been inferred to be caused by dark matter. It is the presence of matter that causes the surrounding medium of empty space to alter slightly, causing the refraction of light. Yes, matter and dark matter effects are tightly linked. Time to stop the personal feuds/arguments based on OLD assumptions/arguments which recent astro discoveries/reviews have made OBSOLETE due to the NOW-SEEN but ORDINARY Baryonic/Fermionic matter within, between galaxies/clusters/superclusters at all scales. 1) More than enough BARYONIC matter has been found since the "Missing Baryons" so-called "problem" was INCORRECTLY 'invented' based on INCOMPLETE observational data (now since obtained and making that "problem" IMAGINARY). 2) More than enough ORDINARY matter has been found (and more still being found!) to more than explain the various galaxy/cluster etc 'rotation/behaviour' etc by CORRECTLY applying GR to same and also realizing that various NON-KEPLERIAN orbital regimes/distributions give what is observed already, and WITHOUT 'exotic' DM being needed....hence 'exotic' DM "problem" was also INCORRECTLY "invented" due to old naive/incomplete assumptions/data! The above relation now 'constrains' ALL 'exotic' DM hypotheses/distributions to CLOSE PROXIMITY to visible ordinary matter distribution/densities! Meaning that ALL 'exotic' DM hypotheses re type and distribution are NOW MOOT and excluded by mainstream observations above! Now it remains for 'exotic' DM proponents to explain why these exotic' DM (which must now be closely associated with the visible matter/distributions) are NOT being found at all so far. If visible matter distributions/behaviour within and between galaxies/clusters etc 'demands' that all 'exotic' DM must be closely related to the GR and NON-Keplerian regimes etc observed FOR visible matter; and if we are now finding more than enough ordinary Baryonic/Fermionic matter within those regimes to explain the GR/NON-Keplerian motions etc, THEN what do we 'need' 'exotic' DM hypotheses FOR? RC.........the reason DM Enthusiasts don't give up the ghosts of their Cosmic Fairy Dust is because they are saddled with one Narrative driving yet another Narrative. Zwicky's theory about envelopes of DM surrounding Spiral Galaxies rises & falls on these INFERRED HYPOTHESES about what prevents Spiral Galaxies from imploding. If just one of these Inferred Hypotheses fails, the entire house of cards fail, and that house of cards has become increasingly shakier with recent discoveries that you allude to. So, it looks as if, with all of the different kinds of matter found in, around and between stars, that they have enough mass that gravity and the forces from known matter are all it takes to produce the speed of rotation we see in these galaxies. Some people haven't read any of the papers on this subject. The SPARC relationship says their is tight relation between visible mass and gravitational mass but it isn't 1 to 1 away from the bulge. Read the paper before you make nonsense claims. IF the DM is NOW closely related/distributed according to visible baryon/fermion matter distributions, then all those old hypotheses are EXCLUDED. Which isn't true. Ludlow et al. 2016 shows that a set of simulations run before the SPARC relation was published are consistent with the relation and right scatter. Dark matter simulations reproduce Tully-Fisher, we already knew dark matter and matter were related. then exotic DM is NO longer NEEDED to explain obsolete "missing baryon problem' and 'exotic matter' angle. Proof you don't know what you're talking about. The missing baryon problem is the issue that the the baryon density measured from the CMB and BAO in standard cosmology (i.e. Lambda Cold Dark Matter) is more than total observed density, most likely because the WHIM doesn't have many observable absorption lines. If you don't believe in CDM then you don't believe in standard cosmology and hence the missing baryon problem isn't a thing because you don't believe the prediction of the baryon density. Dark matter was never used to explain the missing baryon problem. If there was enough matter the relationship would be 1 to 1, it isn't. Hmmm, a boost for MOND. Very interesting. Even more interesting, dark energy appears to be part of GRT. Could dark matter be one too? I'm just kickin' the can down the road here. It will be interesting to see if we get DM searches for MOND instead of particles soon. The paper above shows that your claim is TOTALLY false. You seem to be conflating the missing baryon issue with DM. The missing baryon problem HAS been pretty well resolved in the manner you suggest, but this does NOT affect the need for DM. You clearly do not realise the scale of the issue. The Milky Way DM content is estimated to be ~500 BILLION solar masses. All your vaunted "recent discoveries" together represent a drop in the ocean compared to this. The situation in clusters is even more extreme, with literally HUNDREDS OF TRILLIONS of solar masses of DM needed to explain the dynamics. To claim that this amount of baryonic matter has recently been "discovered" is laughable. If you want to disagree, then PROVIDE EVIDENCE for "recent discoveries" of baryonic matter on THIS scale. @IMP-9 and @RNP, I'm going to suggest here that @RealityCheck is not worth your time. I no longer respond to this individual unless I'm kicking trolls for personal amusement. @Uncle Ira has provided links to this individual's web site and they look like timecube stuff to any disinterested observer. I suggest you google timecube if you're not sure what I'm talking about. It would probably be more productive to ignore the spam and concentrate on conversations that are a bit closer to reality. I take your point. It is the smugness with which RealityCheck pens his easily refuted nonsense that sometimes makes a response irresistibly tempting. However, I will try to exercise a little more self control in future. Point in fact it's the reverse of what you say. It takes a huge amount of "smugness" to declare 80-95% of the Universe is MISSING with zero evidence for it. All you've got are your mindless narratives driving yet other mindless narratives, alias INFERRED GRAVITY. Why don't journalists like you just cease it with parroting Pop-Sci culture. You're simply a Public Relations parrot for whatever institution you write up your PR posts here in this chatroom. Don't feel too bad, @RC gets to me sometimes too. I'll see someone's quote of him and off I go. So what do you think of MOND? I'm not, heh, fond of it, but if it does turn out like that my expectation is we'd see another term added to the left side of the EFE. I wouldn't expect GRT to be wrong, in other words, just incomplete. But I think we'll find a particle, more likely, to explain DM. Personally, I would PREFER a MONDian style explanation. After all, we are forced to extapolate our theory of gravity in distance MANY orders of magnitude beyond the range we have been actually able to test it. This would be heavily criticized if it were done in any other physical theory. HOWEVER, the astrophysical evidence (mainly the Bullet cluster and Pandora's cluster) seem to me to be fairly convincing evidence for a "matter" source. Of course, if this is the case, it would appear on the RHS of EFEs, i.e. as a contributor to the stress-energy tensor. Also, I *think* that the fact that DM is observed to be clustered into clumps and filaments on cosmological scales would preclude it from being a contributor to the Einstein tensor, as it would then also have to be a property of empty space. Your reading bias/incomprehension is getting in the way. If you read properly, you would have seen (obviously) that I was talking about the ORDINARY MATTER (baryonic/Fermionic) being NOW discovered everywhere. You would also have seen that I DISTINCTLY separated the TWO "problems" (missing baryons and 'exotic' dark matter aspects); I never said exotic DM had anything to do with missing baryon problem; I said BOTH 'problems' were 'invented' based on INCOMPLETE observations, which NOW are being completed and finding PLENTY ENOUGH ORDINARY MATTER to totally eliminate the 'need' for BOTH 'missing baryon' AND 'exotic' DM hypotheses. Moreover, the close association of the above observations is WITHIN GALAXIES. Whereas the other 'exotic' DM hypotheses claimed it was between galaxies/galaxy-clusters AND DISSOCIATED FROM their visible extents during 'collisions'...but NEWLY 'seen' ordinary matter now explains that 'gravitational anomaly' too! Also, I *think* that the fact that DM is observed to be clustered into clumps and filaments on cosmological scales would preclude it from being a contributor to the Einstein tensor, as it would then also have to be a property of empty space. Wow......What did you just mindlessly mutter? You know, just for those of us who got no further in our education than a few semesters of nuclear physics/engineering. You sleep on astroturf when you go to bed at night & when you wake up each morning this is the kind of unintelligible drivel created by osmosis contact with astroturf? No wonder you make such a good journalist, your storytelling narratives are even beyond science fiction. That's a pretty persuasive line of argument, especially when added to the Bullet Cluster. So the picture we're left with is, dark matter in a stable galaxy couples pretty closely to the baryonic matter, but in a galaxy (or pair of galaxies) undergoing instability, for example a collision, it can become decoupled. This jibes well with our understanding that dark matter couples only through gravity, and more weakly than baryonic matter even gravitically. More evidence could be compiled by showing that the situation in the Bullet Cluster is not unique. Direct quote. The only person struggling with what you said is you. Is this how you read/parse a sentence, without regard to the whole content/context of that senstence and the wider thrust/context of the overall post/exchange? No wonder you keep kneejerking/responding to 'imagined points' instead of the actual points made. Your pretty hypotheticals-based 'conversation' re Bullet Cluster and other deep space 'exotic' DM assumptions/interpretations is now OBSOLETE, unnecessary, since we found that 'gravitational behaviour' previously incorrectly ascribed to 'exotic' DM 'decoupled-during-collisions' is NOW being correctly ascribed to FOUND ORDINARY MATTER (baryonic/fermionic) extents which were always there!....extending much further from galaxy 'previously visible edges', all the way into deepest space between galaxies/gal-clusters! The material is found, and it is not 'exotic' decoupled etc etc as you still 'believe' base on hypotheticals which are increasingly falsified by new discoveries by mainstream astronomers themselves. This 'latency' in 'up-dating' yourselves as to facts, is the reason you still 'parrot' now-obsolete assumption/interpretation which are WRONG. Stop it. Found PREVIOUSLY 'dark' ordinary matter within/between galaxies explains it now.